This is one of the bakes that I will quickly whip up if I am given a very short notice of friends coming for tea. Madeleines are very easy to prepare and taste very delicious. It is also classy and light. It takes just a short while to bake in the oven. We can put it into the oven to bake once our guests are seated. For less than ten minutes in the oven, our guests will have nice freshly baked madeleines. The madeleine is a traditional small sponge cake from Commercy and Liverdun, in northeastern France. 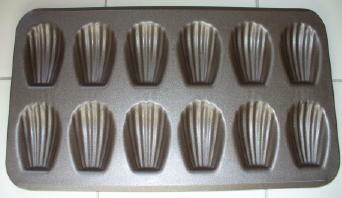 Madelenes have a distinctive shell-like or scallop shape acquired from being baked in pans with shell-shaped depressions. The story in the 18th century goes that a girl name Madeleine made them for Stanislaw Lezczynski, Duke of Lorraine, who loved them so much that he then gave some to his daughter, Marie, the wife of Louis XV. Their popularity grew from that point on and enjoyed round the globe. A genoise cake batter is used. The flavour is similar to, but somewhat lighter than, sponge cake. Some traditional recipes include very finely ground almonds. A variation uses lemon zest, for a pronounced lemony taste. Traditional madeleines have a big bump on their backs. If you chill your batter, all the bigger the hump will be. But if you have no time to chill, bake it straight away and it will still taste the same, only with a smaller hump or bump. Beat in lemon zest and vanilla extract. Fold in the sifted flour mixture by hand. Add in the melted butter. Mix until the butter is incorporated. If not, you can bake it without chilling it. The special technique for baking madeleines and for getting a big bump on their backs is to combine hot and cold. Center a rack in the oven and put a baking sheet (hot) on the rack and preheat the oven to 200 C (400 F). Spray the special madeleine pan with cooking spray or butter and dust with flour. Fill pan with 3/4 full of chilled batter. Bake the madeleines for 8 minutes on the very hot baking sheet or until the madeleines are golden and the tops spring back when touched. Remove the pan from the oven and release the madeleines from the molds by rapping the edge of the pan against the counter. Gently pry the madeleines from the pan using your fingers or a butter knife. Transfer the cookies to a rack to cool for a while. Dust with icing sugar and serve shell side up with tea or coffee.